Between London and Beijing: Cheers! Two dozen reasons to celebrate. Cheers! Two dozen reasons to celebrate. Its strange that the theme song from a 80's American sitcom would be constantly in my head in a small village in Turkmenistan, but I can't help but hearing the line "Sometimes you want to go where everybody knows your name.... " echoing in my head as I walk through my village on the way to work. I'm greeted by name by almost every person I see and in a few cases of the little kids I've been teaching in my English clubs I even get a few "Hello, How are you? I am excellent". I go back to that song everytime I'm feeling down. The week after I came back from my March trip into the city was one of those times. The situation with my first family was ackward and I made plans to move as soon as possible, but it still took a few days to get everything organized through the migration office and my new host family. It was definitely my first time experiencing real homesickness here so far, but once I got settled in with my new host family things started to look up. They are a family with a mother and father my own parents' ages with 4 children (2 boys, 2 girls). 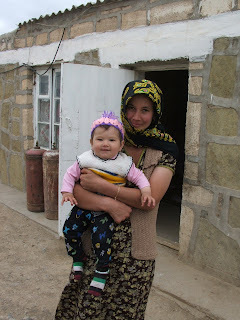 The older son and daughter who are my age work and study in Turkmenbashy on the Caspian Sea. The 19 year old son and his wife (who shares a birthday with me!) and 11 month old rolly poly toddler, Soyli, (in the photo with her mom) and younger 14 year old sister live at home. They are really warm and helpful to me and I feel the much needed motherly affection of my host mom. They have also taken me on excursions to the mountains (where I counted 54 turtles in one day) and Parawbibi the spiritual tourism site in the mountains about 1/2 an hour away from Serdar city where a young religious female saint apparently escaped persecution by miraculously being swallowed up by the mountains. I'm about to head back to my village after 4 days here at a conference for PCV's and their counter-parts to learn about project design and management and taking care of other work. The conference was a great chance to get my project kick-started and help my counter-part learn about the planning process. We are planning to remodel a room in a nearby house that belongs to the hospital for use as a health training room. We hope to use the room for exercise classes for women, healthy cooking classes and health clubs and first aid lessons for teenagers. We have a lot of work ahead of us from grant writing to finding in-kind donations and planting our vegetable garden (a big tangyr yalkasyn-thank you to Michael for the seed donation!) to provide ingredients for our cooking classes. This was a perfect time to come into Ashgabat as I got to celebrate my birthday here in the capital hanging out with other PCV's and enjoying the city life for a bit (including the glory of hot SHOWERS!). Back in the oba (village) I managed to complete my first carpet which was turned into a small cellphone purse (you can see me making it below). Unfortunately, still waiting for the cellphone to fill it. My one and only complaint about my site is communication can be a bit tricky, but thanks to my site mate in the city I manage to stay in touch with the world at all. Anyway, its amazing what you can pick up when there is no technology around to distract you. For now, Wishing you all a Happy Easter (tomorrow is the Russian Orthodox version) and new beginnings all around! 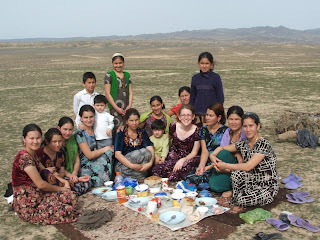 Health Extension Peace Corps Volunteer in Turkmenistan September 2008-2010. This blog does not represent the views and opinions of the US Peace Corps or Peace Corps staff.